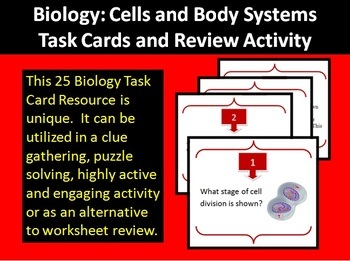 This 25 Biology: Cells and Body Systems Task Card resource is unique. It can be utilized in a clue gathering, puzzle solving, highly active and engaging activity and/or as an alternative to worksheet review for High School Biology. Buyer Comments: "LOVE THIS!!!! Thank you so much"
"I really enjoy task cards like these for extra credit and extra practice activities for students who finish early." "Tons of wonderful cards for review activities!" 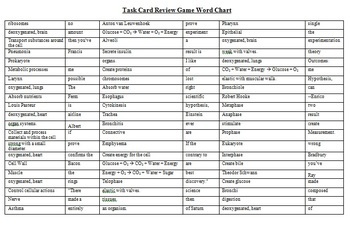 2) Task card review game - lots of fun! - Students are placed in groups and have to work their way through the task cards. 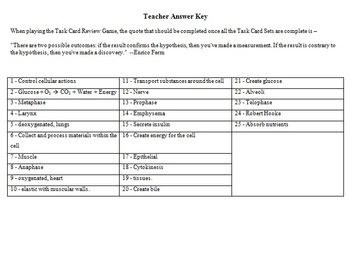 Each task card answer leads the student to a clue. This activity is directly associated with my Biology Unit - Cells and Body SystemsClick HERE for a preview. 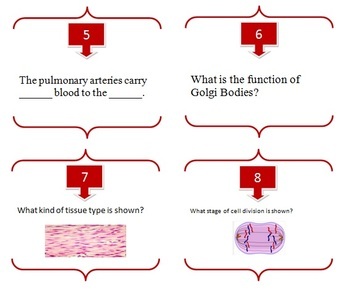 Biology: Cells and Body Systems Task Cards and Review Activity - download the preview to see how you can use this resource in your classroom, learn more about this product and sample four task cards. Biology Unit – Cells and Body Systems - Full Lessons - 9 Power Points, 251 Slides!